From his studio Peter undertakes the conservation of smaller transportable items. Such items include paintings and polychrome decoration of wood, stone or plaster; and smaller sculptures. Clients are generally private individuals, but can also be heritage organisations or churches. 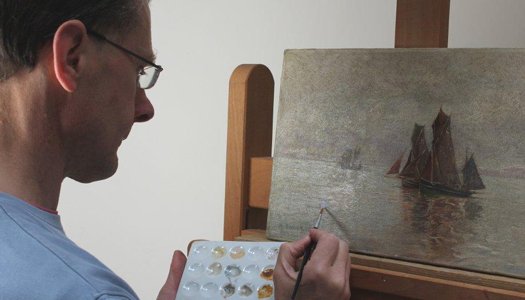 With the conservation of any artefact there is usually a selection of treatments available for consideration. Peter’s approach is to explain and discuss treatment options with the client so that an informed decision can be made as to the most appropriate solution. Within the scope of these discussions it is important to consider longer term conservation concerns; for instance issues associated with display and environment. Although full pre and post-treatment documentation can be provided (as is the case with heritage organisations), generally private individuals do not require this, and often a concise explanation with photographs is all that is needed. Please view the featured case studies for more information about the work Peter has undertaken for private clients. Early C20 English landscape painting by Christopher Sanders, RA. 'Peter Martindale has cleaned or restored a number of oil paintings on canvas for us. We are pleased with the results, particularly a nineteenth century oil of Westminster Bridge and Houses of Parliament which had previously been over-restored, and so presented both technical and aesthetic problems.